So you don’t have a credit card but you want to buy Android apps for your device? No worries, trendblog got your back! In some part of the world credit cards are not that popular of a payment method. But that doesn’t mean that people who don’t own one can’t spend money on apps. In this guide I will show you a few ways how you can purchase apps for Android, even if you don’t have a credit card on your hands. 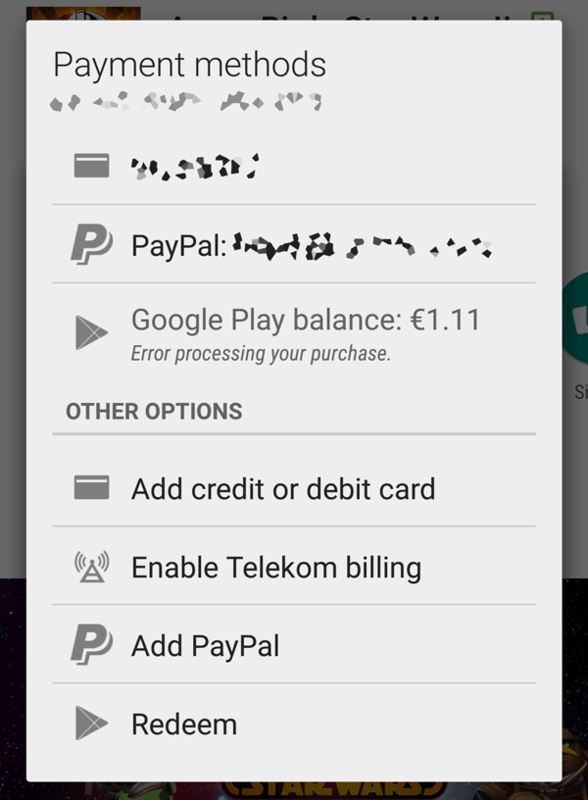 But first, let’s look at a few payment methods NOT suitable for Google Play. Before you start crying tears of happiness and jumping around in pure joy because of what you are about to read, let me stop you for a minute. There are certain payment methods that Google explicitly tells you not to use. In this list you will see bank- and wire transfers, Virtual Credit Cards, Western Union and MoneyGram. The lest three are the usual players when it comes to payment fraud, which is why Google is generally not accepting these methods for payments. One way to purchase paid apps without a credit card is using Google’s very own gift cards to top of you pre-paid Google Play balance. In most countries, these can be purchased in local convenience stores, supermarkets and even on Amazon. If you aren’t sure whether you can buy gift cards where you live, check out Google’s list of authorized retailers by country. If you happen to be from India, there is currently no authorized Google Play reseller. In some countries Google allows you to pay for apps with a single SMS, the cost of which will be directly added to your monthly phone bill. In the United States, AT&T, Sprint, T-Mobile, US Cellular & Verizon users can purchase apps using so-called direct carrier billing. Here you will find a full list of countries and accepted carriers. Spoiler alert: Vodafone customers can no longer use this feature. One of the more popular choices for those without credit cards is using PayPal instead. PayPal allows you to link your bank account directly to the service, so you can easily pay straight from your own account. In case you don’t want to give PayPal direct access to your bank account, you always have the option to top it up via wire transfer. 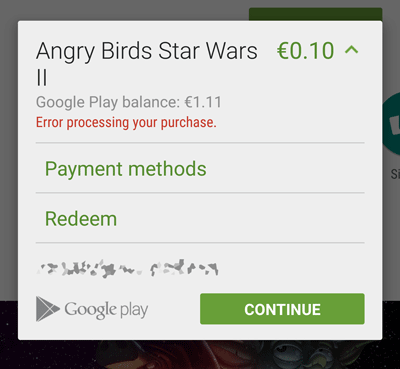 As you might have seen in the screenshot above, I have an existing Google Play balance of €1.11. Full disclosure, I have earned this fortune simply by using Google’s very own Opinion Rewards program. Google’s survey app is currently supported in the following countries: United States, Canada, United Kingdom, Australia, Germany, Italy, Netherlands and Japan. Of course, there are ways to make it work in any country, but it’s simply not worth the hassle to go though all these steps. To add another payment method on Google Play, simply open the Google Play app, visit the page of a paid app and press on “Purchase”. Don’t worry, you will not be billed without any further confirmation. Once you see a pop-up prompting you to either enter a password, press on the little arrow on the right side of the app’s price and you will see a drop-down menu. Now press on Payment Methods to add a new one. You will automatically see a list of available payment options for your country, as well as whether your mobile carrier allows payments via SMS. All these give users a wide selection of apps, and sometimes even offer the same apps at lower prices compared to Google Play! Check out our own guide if you want to learn more about Google Play alternatives.